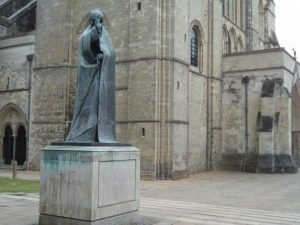 I’m going to start with St Richard of Chichester because I was in that cathedral city last Sunday and seeing the statue and the shrine at the cathedral reminded me of Dover’s connection to the saint, and it is that aspect I’ll give you here. However, it is worth noting that the cathedral (and bishop’s gardens) feel very much part of the city rather than stuck behind a barrier in the form of a gated precinct with enclosing wall. 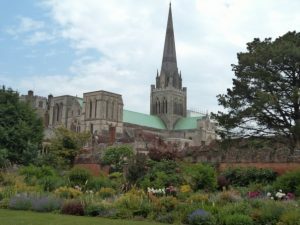 Interestingly, the roof of the cathedral, like Canterbury, is under repair, although in Chichester’s case this is the east end rather than the west at Canterbury. But to return to St Richard and Dover, as bishop of Chichester he was on a preaching expedition at Dover in 1253 to raise funds for the forthcoming crusade. He was seriously ill at the time but had been able to consecrate a chapel to St Edmund of Abingdon which was close to St Mary’s hospital (or the Maison Dieu) to the north of the town adjacent to the road to Dover. The chapel was associated with the hospital’s cemetery for the poor and was staffed by the hospital brothers. As a hospital for poor pilgrims, it presumably accommodated some very sick persons, although whether it operated a policy similar to St Thomas’ hospital at Canterbury is unknown. At the Canterbury hospital sick pilgrims, unlike those who were well, could stay until they recovered sufficiently to continue to Becket’s shrine or until they died. In the latter case, they would be buried in the cathedral priory’s lay cemetery. Thus, in death those at Dover, too, would receive burial close to an archiepiscopal saint. Bishop Richard was also accommodated at St Mary’s hospital and it was there that he died. His body was carried from there to Chichester for burial, but his entrails were buried with due ceremony in the newly consecrated chapel. Within a short time, miracles were said to have occurred at Dover, and, in 1261, his name was added to the catalogue of saints, his cause championed by Henry III and his magnates. For the hospital, having a shrine to St Richard meant they could become a minor focus for the saint’s cult, especially meritorious because of the chapel’s role in aiding the poor, the priest brother from the hospital celebrating divine service at the chapel, as well as acting as shrine-keeper and celebrating requiem masses for poor pilgrims. This gift of St Richard – the giving of ‘the bowels of his body to the poor’ – was recorded by Ralph Bocking, the bishop’s confessor, in his life of the saint written in about 1270. Unfortunately, like the hospital itself (dissolved in 1544), the chapel suffered as a result of the Reformation and over the centuries it was used for a variety of commercial purposes, but it survived where so many other churches and chapels did not. Indeed, it is now back functioning as a chapel, and, even though it still requires further structural work, it is a remarkable feature of Dover’s past and it is a pity that it is not better known. So, if you are in Dover, I would recommend going to look for the chapel, and similarly St Mary’s hospital – it became the royal store house and victualling yard, later the town hall and prison, and there is a new project to restore this important historic building. 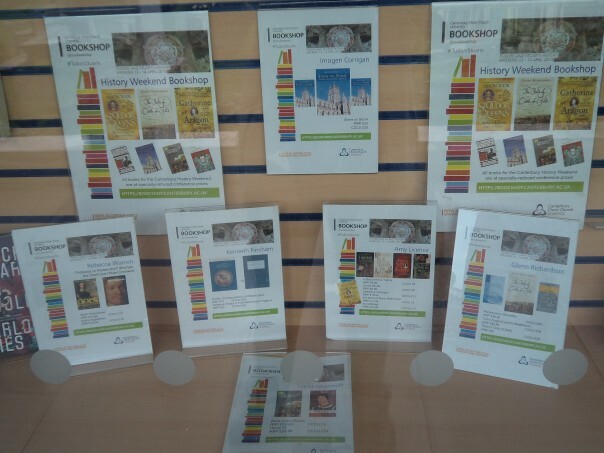 Turning to the Folkestone saint, Dr Lesley Hardy, who heads the HLF-funded ‘Finding Eanswythe’ project, took me on a tour of ‘medieval’ Folkestone yesterday and I now have a better idea about the layout of the old town. I suppose the heart of medieval Folkestone was the parish church with its accompanying priory, which together sat just outside the walls and ditch of The Bayle or castle. It seems unlikely that the later priory was located on the footprint of the Anglo-Saxon nunnery, not least because of the erosion of the cliff and the necessary re-ordering of the post-Conquest alien Benedictine house founded in 1095 (the monks coming from Lonlay in France). This house, too, appears to have moved from inside to just outside the castle about 40 years after its foundation, remaining to the south of the church until the priory was dissolved in 1535. Yet, even if it is not clear exactly where the Anglo-Saxon religious house was located, the final point of St Eanswythe watercourse at the pond in The Bayle is suggestive of it having been nearby. In addition, this watercourse ran close to one of Folkestone main medieval streets, the Pent stream tracking another of the old town roadways. Coming down from the cliff towards the sea shore, I was again struck by this separation in medieval times of the fishing community from the mercantile, and in this case aristocratic and religious, communities. For the Stade was to the east of the foot of the cliff, the modern harbour to the west of the Stade and almost directly below The Bayle. Consequently, medieval Folkestone was pretty compact, almost stretching as much vertically as it did horizontally. 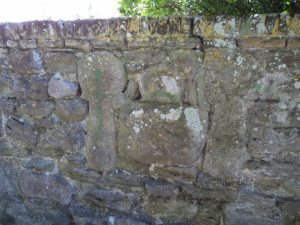 However, to get back to Eanswythe and the church, which is a double dedication to this royal Anglo-Saxon saint and Our Lady, the first thing that Lesley showed me was a group of medieval grave markers which have been built into the wall to the south-west of the church. These are interesting but one in particular is deteriorating badly and they all need some care and attention. We then went into the church so that Lesley could show me around this gem of a church, especially for those who are interested in high Anglican decoration from the Victorian period. This is a feature of other parish churches in Folkestone but only this one has its beginnings as a fine medieval church. Moreover, as both the priory and the parish church it is intriguing to try to work out how it would have been used in medieval times. The presence of the priory on the south side away from the town probably means that, in addition to the nave, the north aisle was the province of the townspeople, while the central chancel and south aisle were for the use of the Benedictine monks. Yet whether this continued right up to the priory’s dissolution is a moot point because the religious community seems to have shrunk down to very few brothers in the late Middle Ages – as seen in will references and Warham’s visitation of 1511. Yet, even if the priory was a shadow of its former self by this period, the wills suggest a vibrant parish community, and alongside this the civic authorities also saw the churchyard as in some ways theirs because it seems the annual mayor-making took place there, reminiscent of conditions at Rye, whereas other Cinque Ports were using their parish churches for such rituals at this time. Turning more specifically to parochial and sub-parochial activities by Folkestone townspeople, there were numerous lights to which testators left bequests, including common ones such as St George, St Peter, St Stephen, Corpus Christi, the Cross and St Christopher. 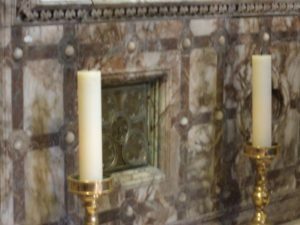 Similarly, the holy family were remembered: St Anne, the Assumption of Our Lady, Our Lady of Pity and Our Lady behind the High Altar, but for the purposes of the project what is interesting to see are references to the light of St Eanswiche and St Botolph. Furthermore, there is a small clusters of bequests to St Eanswithe in the mid 1470s, which may be only an accident of will survival, but is worth noting alongside bequests towards work on the north aisle at about the same time, albeit it may be coincidence. It is perhaps worth mentioning that bequests towards the pews similarly occur at this time. 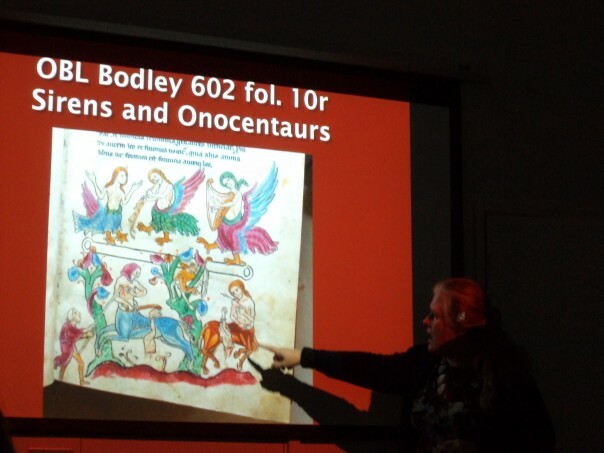 I had also recorded the intriguing reference in Isabel Allowe’s (1474) will to her granddaughter’s name of Eanswithe that suggests ‘their’ female royal saint remained a potent force in the minds of the townspeople, and Dr Melanie Caiazza found a similar devotion to the name Sexburga on 15th-century Sheppey. Yet this was only from a quick scan again at the Folkestone wills and it is feasible there will be more useful material when I get a chance to spend more time on these records. 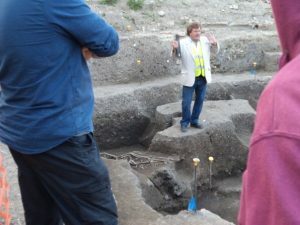 Finally, before I conclude this week’s report, I thought I would mention a fascinating guided tour of the Slatters Hotel excavation site which was given to Friends of Canterbury Archaeological Trust and many others – notified through various group websites for people in Canterbury and its hinterland. Indeed, there were some from the Tunbridge Wells area of Kent who had come over to Canterbury specially. People were not disappointed, and Paul Bennett (Director of Canterbury Archaeological Trust and a Visiting Professor in the Centre) took his audience through the maze of structures and soil horizons from the natural brick earth with its Iron Age plough marks above to modern times. In-between he showed us evidence of substantial Roman town houses; the use of tufa as a light but very strong building stone; what was to all intents and purposes a mass grave – perhaps response to plague in the 4th century; a return to wooden dwellings with tell-tale post holes, often accompanying shops in the 5th century. Paul was also keen to show his large audience the footprint of a mid Anglo-Saxon large aisled hall which he is especially excited about. Although much of the later archaeology has now been removed, in a little over an hour Paul took his audience all the way up to the Second World War, when the hotel was bombed, an amazing achievement and a great opportunity to gain a better understanding of Canterbury’s development.